Brierley+Partners, internationally recognized as the industry leader for creating lifetime loyalty for their customers’ brands, is moving its global headquarters to The Offices One at Frisco Station. Brierley+Partners will occupy a total of 56,703 square feet on the sixth and seventh floors of the Class A building located within Frisco Station, the 242-acre mixed-use project located at the northwest quadrant of the Dallas North Tollway and Warren Parkway. The new Brierley+Partners’ global headquarters will provide ample space to support current and future growth, as well as facilitate collaboration with clients and between Brierley’s global offices in Los Angeles, Tokyo and London. The office will be designed with employee and client needs as the primary focus. Providing employees with natural light and outstanding views, as well as doubling the amount and variety of meeting spaces, employees will have access to building amenities, including a tenant lounge, fitness center, structured parking and a large conference center. As an organization centered around engagement and collaboration, Brierley+Partners gave employees the opportunity to provide feedback through company-wide surveys on preferred amenities, location and building features. On Friday, September 21, Brierley+Partners hosted a reception for employees to preview the new office space, learn about the high-quality, on-site amenities available and enjoy the unobstructed views of downtown Dallas, Las Colinas, Lake Lewisville and Denton on the horizon. 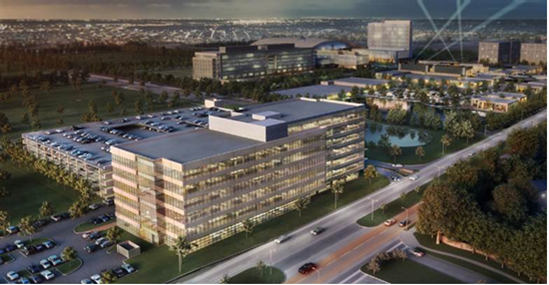 Brierley+Partners and its employees will benefit from the AT&T 5G Evolution wireless technology that is being integrated across Frisco Station’s parks, residential options, hospitality units and corporate spaces. Featuring some of the latest integrated connectivity from AT&T, Frisco Station is one of the first developments in the nation being built from the ground up with wireless stealth micro cells, ultra-fast internet powered by AT&T FiberSM and robust Wi-Fi throughout all common areas. Through this technology, building residents will have access to the ultimate wireless experience throughout The Offices One at Frisco Station, across the 32 acres of trails and park spaces, residential and hospitality units. Adjacent to the Dallas Cowboys’ world headquarters, The Offices One at Frisco Station is within walking distance to more than 50 retail, restaurant and entertainment options between The Hub at Frisco Station, the development’s planned entertainment district, and The Star. More than 2,400 urban living units will also be available for residents who want to be in close proximity to Frisco Station’s employment opportunities and regional employers, along with dining, entertainment and wellness amenities. “Brierley+Partners is a venerable North Texas company that was seeking a vibrant, mixed-use environment to support its future growth, and Frisco Station provides this environment very well for them,” said Craig Wilson, executive managing director of Cushman & Wakefield. Randy Cooper, Craig Wilson, Kate Sudol and Wills Bauer of Cushman & Wakefield represented Brierley+Partners, and Johnny Johnson, Chris Taylor and Clint Madison of Cushman & Wakefield represented VanTrust in the transaction. Frisco Station is being developed by the Frisco Station Partnership, which is composed of The Rudman Partnership, Hillwood Properties and VanTrust Real Estate. Built on the principle that individuals want to be inspired and energized by the people and environment around them, Frisco Station’s designers are focused on creating a healthier, smarter and more creative experience for people who want to engage, innovate, learn and collaborate in their professional and personal lives. Brierley+Partners are global loyalty and CRM innovators. Brierley brings industry-leading thought leadership, incomparable experience and advanced technologies to help brands build lifetime loyalty with their customers. Brierley runs some of the best loyalty and customer relationship programs for clients across the globe. Brierley offers a complete suite of loyalty services: program design, loyalty/CRM technology, marketing strategy, research, analytics, omnichannel communications, account management, interactive/print production and fulfillment. The industry-leading Brierley LoyaltyonDemand® technology platform is uniquely robust, modular, flexible and quick-to-market. All services and technology focus on a single mission: making clients' customer relationships dramatically more profitable. Brierley is U.S.-based and is a wholly-owned subsidiary of Nomura Research Institute, headquartered in Tokyo, Japan. To learn more about Brierley+Partners, visit http://www.brierley.com/. VanTrust Real Estate, LLC is a full-service real estate development company. The company acquires and develops real estate assets for the Van Tuyl family portfolio and offers a broad range of real estate services including acquisition, disposition, development, development services, and asset management. Product types include office, industrial, multifamily, retail, institutional, governmental, hospitality, and recreational. VanTrust works nationally with regional offices in Columbus, Dallas, Phoenix, and Jacksonville with its headquarters in Kansas City, Missouri. Cushman & Wakefield (NYSE: CWK) is a leading global real estate services firm that delivers exceptional value by putting ideas into action for real estate occupiers and owners. Cushman & Wakefield is among the largest real estate services firms with 48,000 employees in approximately 400 offices and 70 countries. In 2017, the firm had revenue of $6.9 billion across core services of property, facilities and project management, leasing, capital markets, valuation and other services. To learn more, visit http://www.cushmanwakefield.com or follow @CushWake on Twitter.